Wrapping too loosely Your baby's movements will inevitably loosen the blanket a little, so make sure her arms are straight and the final corner is tucked in securely. A loose blanket around a baby's face is a risk factor for sudden infant death syndrome (SIDS). Overheating If your baby's neck and ears are red or hot or she's sweating, unwrap her to remove her clothing and try again; or turn on a fan (this also reduces SIDS risk). Giving up too soon Practice swaddling your baby when she's in a good mood, and give yourself several tries. Dads are especially good swaddlers, says Karp. Many babies are ready to sleep unswaddled at 3 months to 4 months old. To "wean" your baby, try swaddling her with one arm out. If she gets fussier this way, try again in a few weeks, suggests Karp. 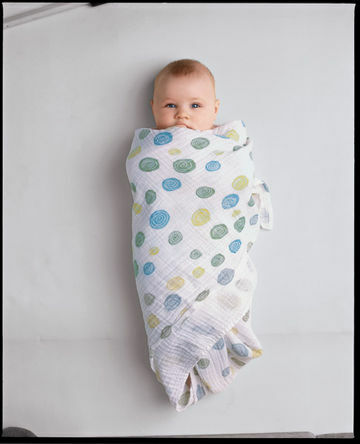 Click here to find step-by-step instructional photos showing you how to swaddle your baby.